A Florentine navigator and pilot major of Castile, Spain, Amerigo Vespucci, for whom America is named, played a major part in exploring the New World. The father of Amerigo Vespucci was Nastagio Vespucci, and his uncle was the learned Dominican Giorgio Antonio Vespucci, who had charge of Amerigo's education. The entire family was cultured and friendly with the Medici rulers of Florence, a family that ruled Italy from the 1400s to 1737. Domenico Ghirlandaio (1449–1494) painted Amerigo in a family portrait when the youth was about nineteen. However, the explorer had reached his forties by the time he began his voyage to America, so Ghirlandaio's painting shows only an approximate idea of Vespucci's mature appearance. It is known that Vespucci visited France, in his uncle's company, when he was about twenty-four years old, and that his father intended for him a business career. He did get involved in business, first in Florence and then in Seville, Spain, in a bank. Later, in Seville, he entered a partnership with a fellow Florentine, Gianetto Berardi, and this lasted until Berardi's death at the end of 1495. Meanwhile, Christopher Columbus (1451–1506) had made his first two voyages to the West Indies, and he returned from the second in June 1496. At this time, he and Vespucci met and talked, and Amerigo appears to have been doubtful of Columbus's belief that he had already reached the outskirts of Asia. Moreover, Vespucci's curiosity about the new lands had been aroused, together with a determination—though no longer young—to see them himself. According to a controversial letter, Vespucci embarked from Cadiz, Spain, in a Spanish fleet on May 10, 1497. Serious doubts have been raised about the letter's authenticity (based on fact), because dates in the letter do not coordinate with authenticated events, and because the voyage, if made, presents serious geographical problems and seems to have passed unnoticed by the cartographers (mapmakers) and historians of the time. If the letter is real, the ships passed through the West Indies—sighting no islands—and in thirty-seven days reached the mainland somewhere in Central America. This would predate Columbus's discovery of the mainland of Venezuela by a year. On their return to Spain, Vespucci's men discovered the inhabited island of "Iti," identified by some as Bermuda. However, by 1522 the Bermudas were unpopulated. The expedition returned to Cadiz in October 1498. Vespucci, in all probability, voyaged to America at the time noted, but he did not have command and as yet had had no practical experience piloting a ship. Inexperience could explain many of the errors in the letter, but the strong likelihood remains that the letter was altered. In 1499 Vespucci sailed again, and this time there is proof of the expedition besides his own letters. His education had included mathematics, and he had surely learned a great deal from his first crossing. From Cadiz, they first dropped to the Cape Verde Islands and then divided forces in the Atlantic. Vespucci explored to Cape Santo Agostinho, at the shoulder of Brazil, after which he coasted westward past the Maracaibo Gulf. This may have been the first expedition to touch Brazil as well as the first to cross the Equator in New World waters. During these travels, Vespucci probably discovered the mouth of the Amazon River. Two years later Amerigo went on his most important voyage, this time for King Manuel I (1469–1521) to Brazil. Vespucci, having already been to the Brazilian shoulder, seemed the person best qualified to go as an observer with the new expedition. Vespucci did not command at the start but ultimately took charge at the request of the Portuguese officers. This voyage traced the South American coast from a point above Cape Sào Roque to Patagonia. Among the important discoveries were Guanabara Bay (Rio de Janeiro) and the Rio de la Plata, which soon began to appear on maps as Rio Jordán. The expedition returned by way of Sierra Leone and the Azores, and Vespucci, in a letter to Florence, called South America Mundus Novus (New World). In 1503 Amerigo sailed in Portuguese service again to Brazil, but this expedition failed to make new discoveries. The fleet broke up, the Portuguese commander's ship disappeared, and Vespucci could proceed only a little past Bahia before returning to Lisbon, Portugal, in 1504. He never sailed again. In 1507 a group of scholars at St-Dié in Lorraine brought out a book of geography entitled "Cosmographiae introductio." One of the authors, Martin Waldseemüller, suggested the name America, especially for the Brazilian part of the New World, in honor of "the illustrious man who discovered it." After some debate, the name was eventually adopted. During his last years, Amerigo held the office of pilot major, and it became his duty to train pilots, examine them for ability in their craft, and collect data regarding New World navigation. He remained pilot major until his death on February 22, 1512, a month short of his fifty-eighth birthday. Arciniegas, Germán. Amerigo and the New World: The Life and Times of Amerigo Vespucci. New York: Knopf, 1955. Reprint, New York: Octagon Books, 1978. Baker, Nina Brown. Amerigo Vespucci. New York: Knopf, 1956. Donaldson-Forbes, Jeff. Amerigo Vespucci. New York: PowerKids Press, 2002. Fradin, Dennis Brindell. 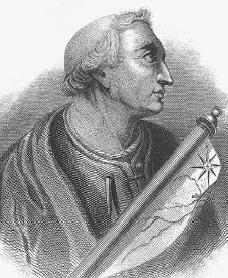 Amerigo Vespucci. New York: Franklin Watts, 1991. Pohl, Frederick Julius. Amerigo Vespucci, Pilot Major. New York: Columbia University Press, 1944, revised edition 1966. Swan, Barry. Amerigo Vespucci. Wembly, Middlesex, England: Valley Press, 1998. This site really helped me with my school project! this site was good. i am not sure of the birth date though. everyone keeps saying that it's wrong and go check an encyclopedia but you're not telling what the real date is. if someone knows please tell me because i am working on a school project and i would like to have the correct date. Thank yoy, the info was helpful. My son is using this sight for schoolwork in Traverse City, Michigan. Wasn't Amerigo Vespucci a steward for Lorenzo de' Medici, and then a buisness partner to Berardi? Besides, it says in books that he was born on the March of 1454, not 1451. Maybe they're wrong, but really, in my opinion, this site is unreliable. this is cool, i got quite a bit of info for my project! he was born march 9th 1454 not 1451! get your facts right!